Is there a security update for the Intel ME firmware for my Razer Blade Pro 17” (2017) – Full HD – GTX 1060? Does the Razer Blade Pro 17" (2017) – Full HD – GTX 1060 have a touch screen? No, the Blade Pro 17" (2017) – Full HD – GTX 1060 does not feature a touch screen. Is the PSU adaptor for the Razer Blade Pro 17" (2017) – Full HD – GTX 1060 the same with the Razer Blade Pro 4K? No, the Razer Blade Pro 17" (2017) – Full HD – GTX 1060 uses a 165W adaptor while the Razer Blade Pro 4k uses a 250W adaptor. You can't interchange the adapters as they use different style connection ports. What are the specifications of the Razer Blade Pro 17" (2017) – Full HD – GTX 1060's display? The Razer Blade Pro 17" (2017) – Full HD – GTX 1060 comes with a 17.3" Full HD IPS matte display with 120Hz refresh capability. Is the Razer Blade Pro 17" (2017) – Full HD – GTX 1060 THX certified? No, the Blade Pro 17" (2017) – Full HD – GTX 1060 version of the Blade Pro is not THX certified. 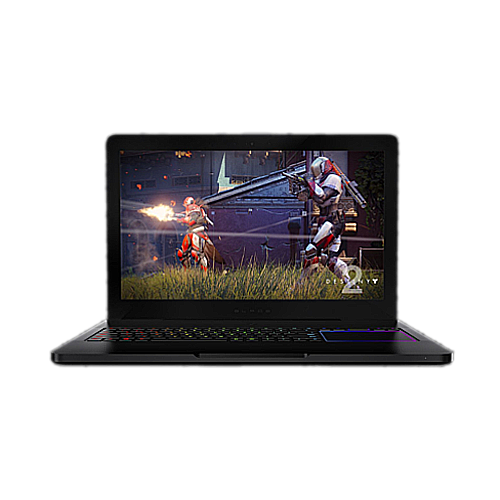 What is the main visual difference between the Razer Blade Pro 17" (2017) – Full HD – GTX 1060 and the Razer Blade Pro 17" (2017) – 4K – GTX 1080? The Razer Blade Pro 4K has a glossy finish, while the Razer Blade Pro 17" (2017) – Full HD – GTX 1060 has a matte finish. Does the Razer Blade Pro 17" (2017) – Full HD – GTX 1060 have mechanical keys? No, it does not feature mechanical keys. Instead, it utilizes Razer's reliable membrane keys. Is the Razer Blade Pro 17" (2017) – Full HD – GTX 1060 VR ready? Yes, the NVIDIA GTX 1060 graphics card is VR (Virtual Reality) ready. Is the Razer Blade Pro 17" (2017) – Full HD – GTX 1060 powered by Razer Chroma? Yes, it is powered by Razer Chroma with the full spectrum of 16.8 million colors. Each of the keys is individually backlit as is the trackpad. Can I upgrade the RAM of my Razer Blade Pro 17" (2017) – Full HD – GTX 1060? Yes, 16GB dual-channel memory comes standard with the Blade Pro 17" (2017) – Full HD – GTX 1060, but it can be expanded up to 32GB. Can I upgrade the SSD in my Razer Blade Pro 17" (2017) – Full HD – GTX 1060? Yes, the Blade Pro 17" (2017) – Full HD – GTX 1060 includes a 256GB SSD and a 2TB HDD, but it can be expanded up to a 2TB SSD and a 4TB HDD. What are the ports available for the Razer Blade Pro 17" (2017) – Full HD – GTX 1060? The Blade Pro 17" (2017) – Full HD – GTX 1060 features three(3) USB 3.0 Ports, Thunderbolt 3 (USB-C), SD Card reader, 3.5mm combo audio port, Gigabit Ethernet and an HDMI 2.0 audio and video output. Razer has authorized repair centers in every region where the Blade is currently sold. To set up a repair at one of our repair centers, please contact our support team at www.razersupport.com/email. Our support team will be happy to give you a rough estimate of the repair costs, but final costs cannot be determined until the unit is physically inspected at the repair center. Only authorized Razer Repair Centers will have the parts and specialized training required to repair your Razer Blade.